If you’re a fan of Kuhl Racing, then what you’re about to see might challenge the conventions of an everyday electric car. 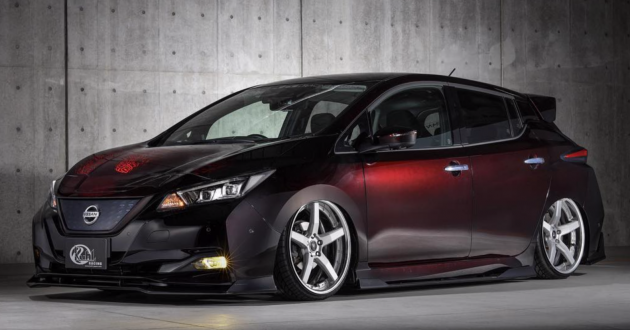 The Japanese aftermarket tuner, famous for its slammed, wide-body designs, has introduced a wild body kit for the 2019 Nissan Leaf. As with most of Kuhl Racing’s offerings, this one will polarise, so you either like it or you don’t. For the Leaf, the kit comes with wider flared fenders, more aggressive-looking front and rear bumpers, sculpted side skirts, a huge roof-mounted rear spoiler, as well as a massive rear diffuser. Interestingly, the bee-sting antenna is left untouched, although we think a shark fin antenna may suit the look better. In living up to its name, Kuhl Racing dramatically reduced the Leaf’s ride height by installing adjustable air suspension. Huge aftermarket three-piece wheels are fitted as well – the left side gets a silver finish, whereas the right gets a gold finish. Of course, negative camber is the name of the game, but here it’s not as drastic as the Toyota Vellfire or C-HR. There’s no mention on performance improvements, so the slammed Leaf should still run on the stock setup. An electric motor up front makes a modest 148 hp (110 kW) and 320 Nm of torque, and it draws power from a 40 kWh battery, which Nissan claims will provide 400 km of range (Japanese JC08 standard). The more powerful Leaf e+ gets a 62 kWh battery pack, making 215 hp and 340 Nm of torque. So, if you’re planning to look cool with your zero emissions Leaf, you know where to look. Anyone fancy this? Nissan Leaf is the best EV around because Nissan make good cars. Now with Kuhl racing, this car looks even better. I like those wheels. So darn nice. Like a giant has sat on LEAF and squashed the car. Hahaha!